Creating art is an important form of self-expression that transcends social, emotional and physical barriers. Art can also be an important part of the healing process that allows people to share inner thoughts and feelings into reality but one that involves people in their healing process and can serve as a way to communicate emotions and experiences. One brief, walk down the Inglis House artists’ gallery and it’s quickly apparent that there is no shortage of artistic talent among our residents. And many of the outstanding works displayed are by people who never dabbled in art before coming to live here. These residents are uncovering and developing their talents with the help of Inglis Artist-in-Residence, Rhoda Kahler. Rhoda is a highly accomplish ceramicist whose tile work has been featured in the national media, including the Home and Garden Television network, and her tile murals appear in public and private collections throughout the Delaware Valley. Her art has also been part of several award-winning displays at the Philadelphia Flower Show. 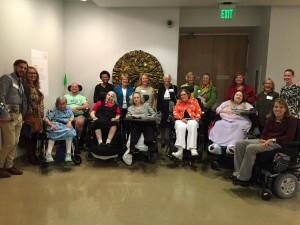 Through their work with Rhoda, Inglis artists have been invited to participate in the Philadelphia Museum of Art’s Bridges: Accessible Programs Builds Partnerships every year since 2012. The program builds a bridge through visual art, and enables those overcoming adversity to create works of art in their studios and exhibit them at the Museum. The group have created collaborative art pieces inspired by the works of Brancusi, Degas, Pop Art imagery, terracotta tile work and more. Though the Artist-in-Residence salary is funded by a grant from Dolfinger-McMahon, funding to support general art programming at Inglis comes from individual donations. Please support the art programs at Inglis.